This recipe comes from the grandmother of one of my best college girlfriends, Sara. She called her Lou Lou. 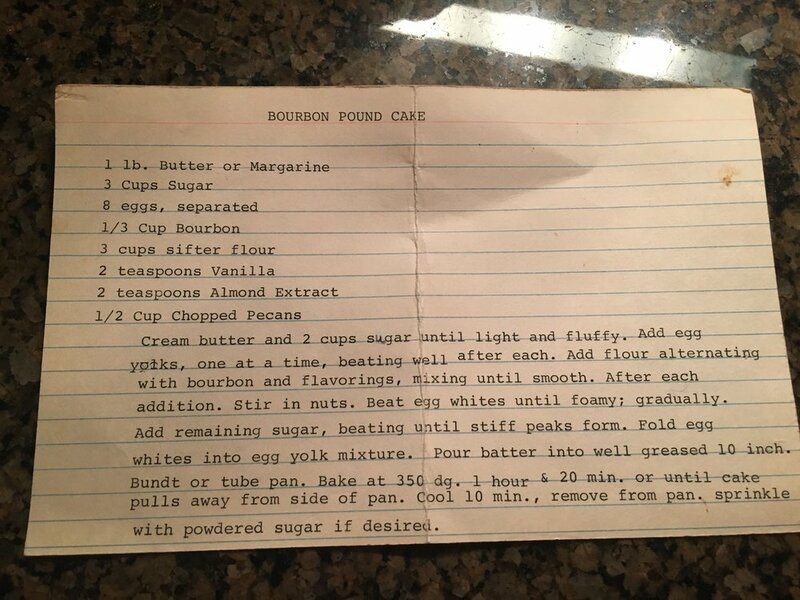 A couple of years ago, Sara shared some recipes with me from her grandmothers cookbook that was passed to her, and this one was one of my favorites because it's beautiful and delicious. I wish I could express to you guys in words how unique and special this cookbook is. Every time she sends me a new recipe or something her grandmother wrote to her from it, I am in complete awe. A lot of the book is hand written and some of the recipes are unlike anything I have ever heard of or seen in all my cooking years - and I mean that in the best way. I told her the other day that I hope she has it locked in a fire-proof safe because this cookbook, y'all, is ANTIQUE GOLD! I am grateful for Sara's long time friendship and these recipes she shares with me. I hope she continues to send me treasures from this piece of family history! Cream butter and 2 cups of sugar until light and fluffy. Add egg yolks, one at a time, beating well after each. Add flour, alternating with bourbon and flavorings, mixing until smooth. After each addition, stir in nuts. Beat eggs whites until foamy; gradually. Add remaining sugar, beating until stiff peaks form. Fold egg whites into egg yolk mixture. Pour batter into well greased 10 inch bundt or tube pan. Bake at 350 degrees, 1 hour & 20 minutes or until cake pulls away from pan. Cool 10 minutes, remove from pan, sprinkle with powdered sugar of desired.